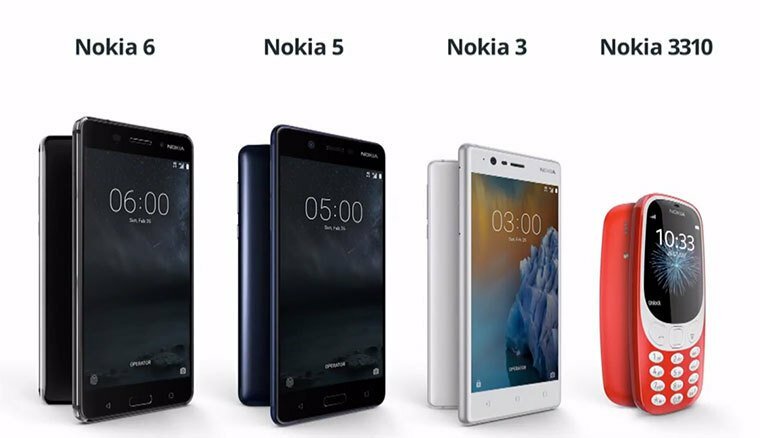 After India, Dubai Now HMD has launched Nokia 3, 5, 6 and the new Nokia 3310 in Cambodia. Nokia 3 features a 5-inch (1280 x 720 pixels) HD display powered by 1.3GHz Quad-core MediaTek MT6737 Processor. It has a 2GBGB RAM and 16GB internal Storage.On camera, it has an 8MP autofocus rear camera with LED Flash and 8MP autofocus front-facing camera Packed with a 2630mAh battery. Nokia 5 feature a 5.2-inch Display powered by Qualcomm Snapdragon 430 processor with 2GB RAM and 16GB of internal storage on camera it has a 13MP rear camera, 8MP front camera Packed with a 3000mAh Battery. Nokia 6 features a 5.5-inch screen with full HD resolution with 2.5D Gorilla Glass. Powered by a Qualcomm Snapdragon 430 processor with 3GB RAM and 32GB storage. On camera, it has a 16MP rear camera with LED Flash and 8MP front facing Camera. Packed with a 3000mAh Battery. Nokia 3310 is USD48, Nokia 3 is priced at USD143 both will be available by the end of June. Nokia 5 is priced at USD193 and Nokia 6 is priced at USD229 both will be available to buy in July.